Cemeteries, funeral parlours, and undertakers have been around in the East End for quite a long time. There are probably native burial grounds in the area, but their exact locations are not known. Originally in our area, when there was not a burial ground, the people, especially farmers, buried their dead on their own land. There was a custom in older times and even for some now, to hold funeral arrangements in that person’s family home or the home of a friend. Later on ceremonies moved to funeral parlours or religious establishments. 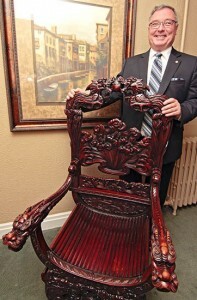 Nick Larter, funeral director at Sherrin Funeral Home, stands by the antique chair that will continue to be a Beach conversation piece when it moves to the Williams cottage in Kew Gardens. We didn’t always have ambulances. Undertakers were often called upon to perform the duties of present ambulance drivers. The funeral parlour staff would respond to emergencies and sick calls, and pick up the injured or sick person and take them to the hospital. These private ambulances were in many cases the only way to treat an injured person, so funeral parlours had varied responsibilities. I am writing only briefly at this time about cemeteries – at a later time I will write more fully on this subject, so please bear with me. So fellow Beachers, please excuse the pun, but funeral parlours are a dying business. Over the years there were perhaps 20 or more undertaking establishments in the East End and the Beach. Now, however, we are down to just a few. This is a part of our history, so let us try to find where these parlours were. One of the first cemeteries was on Queen Street where Woodfield Road is now. This was the burial ground for the Ashbridges, who came to the area in the 1790s. Then there was St. John’s Norway (originally called Berkeley) in the 1850s. Later there were three Jewish cemeteries. One was on the east side of Pape south of Gerrard, one on the west side of Jones south of Danforth, and the third on St. Clair near the end of Dawes Road. Another was planned for Gerrard west of Main Street, but it was never built. Hunter Archibald was on the northeast corner at Main and Danforth, built around 1895. Hunter was one of the first undertakers in the area. He was also a woodworker to supplement his income. His wife took over the business after his death. The business later came under the management of Nelson B. Cobbledick. Over the years this location has housed several undertaking establishments, the most recent being the present Giffen-Mack Funeral Home. Cobbledick’s original house still exists in the middle of the current premises. Stand on the southwest corner at Main and Danforth and look northeast to see the original house standing out like an architectural gem in the 21st Century. We first find Herbert Brown of McDougall & Brown at 1491 Danforth Ave. Later we will find other locations with the McDougall & Brown name. This is not an unfamiliar situation, as many firms merged and moved. We have Ralph Day Funeral Home at 172 Danforth Ave., just east of Broadview. One interesting aspect of that home is that Mr. Day was a mayor of the City of Toronto. Just a few years before his term was Mayor William Stewart, who operated Bates & Dodds, a funeral parlour in the West End of the city (one street east of where your author was born). Both of these establishments are out of business. Francis G. Fuhrman Funeral Director and Home was at 649 Pape Ave. There was another funeral home at 2415 Danforth Ave. – the James Godfrey undertaking business. Danforth had more funeral homes than any other street in the East End, possibly the whole city. Giffen-Mack makes the list again at 2570 Danforth Ave.
You might have guessed that in some cases the numbers have changed, either due to new locations or the renumbering of the street. A lot of the buildings that housed these establishments are still standing. Another one people will remember on the Danforth is Hallowells Funeral Parlour at 2793 Danforth Ave. Another popular parlour was Arthur & Ingrams at 1055 Gerrard St. E. Then there was Ingram-Wear Funeral Home at 2114 Queen St. E., which many Beachers will remember on the north side of the street east of Wineva. There was D.M. Johnston Funeral Home at 465 Gerrard St. E.
Then there were the Mack Funeral Homes. One of the first was on Main Street, on the west side just south of Swanwick. Then we find another Mack home on the southwest corner of Gerrard and Enderby. We then find a Mack Funeral Home on the south side of Queen next to the park at Kew Gardens, and again Mack moved to the north side of Queen, near Bellefair Avenue. On Danforth were the O’Connor Brothers at 1871 Danforth Ave. On Gerrard was the Tierney Funeral Home at 259 Gerrard St. E. Back on the Danforth, Trull Funeral Home was located at one time at 1008 Danforth before moving to the south side at 1111, where they are today, a well-respected establishment in the community. We then move on to Queen and Broadview to the south side at 717 Queen St. E., where Washington & Johnston Funeral Home used to be for a long time. Wear Funeral Home on Queen later moved to 871 Kingston Rd., and later became Sherrin Funeral Home for many years – until the end of this month, when it will also be gone. Not to worry, they have moved out to 2570 Kingston Rd. at McDougall & Brown to serve the people of the East End. Brian, try McDougall & Brown in Scarborough. After W&J closed, records went to Sherrin and assume that when Sherrin closed, the records went to McDougall & Brown. Where would records from 1995 of Ralph Day Funeral Home be archived? Are there any eco friendly funeral providers in the east end? Someone mentioned a new place that offers green burials? Does anyone know how I could find information on Brown Brothers Funeral Home in Toronto. They were on Eglinton Ave back in the early 1960’s?